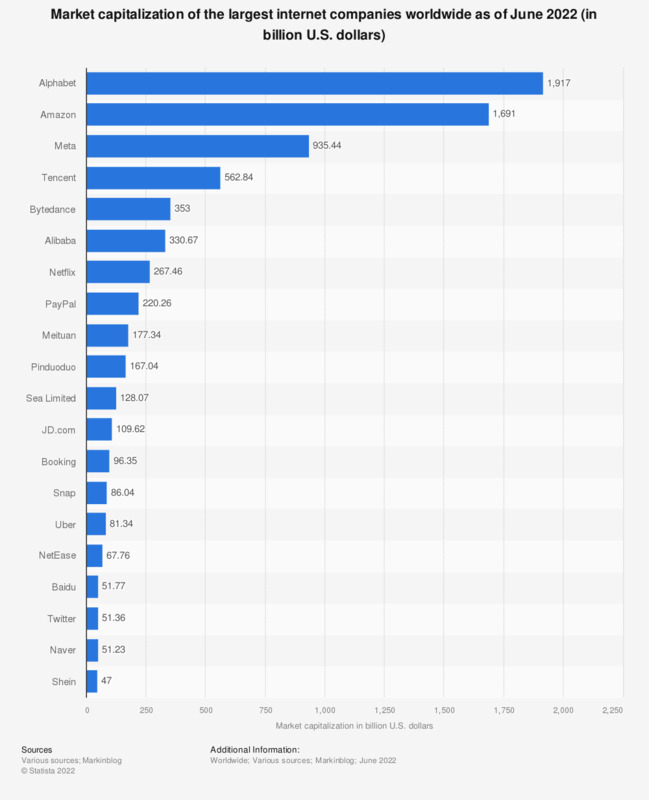 The statistic depicts the market value of the top internet companies worldwide as of May 2018. That year, e-commerce company Amazon's market value was 783 billion U.S. dollars. Search market leader Google had a market value of 739 billion U.S. dollars. The end of the 1990 in the United States saw the rise of a great number of internet companies, also called online companies or a variety of the name “dot com,” where the “.com” domain is derived from the word commercial. At the time, such startups were merely riding the wave of early internet business, but had little capital and perhaps one good idea. Few companies have survived the burst of the dot com bubble and even fewer have managed to become internationally successful. A few notable exceptions are American companies such as Google (founded in 1998), Amazon (founded in 1994) or eBay Inc. (founded in 1995), and the Chinese online giant Alibaba (founded in 1998), which have come to be some of the largest internet companies in the world. Topping the ranking of largest internet companies worldwide is currently Alphabet, the parent company of Google, with a market capitalization of 680 billion U.S. dollars as of May 2017. Having started as a PhD project at Stanford University, the Google project slowly gained traction and is now the number one search engine in the world, with a market share of 90 percent on the search engine market. Due to a number of high profile acquisitions, Google has expanded its portfolio beyond search, to include the video content sharing site YouTube, the digital app platform Google Play Store, the webmail service Gmail and the web browser Google Chrome, to only name a few. As of December 2016, it is also the most visited multi-platform website in the United States, with over 247 million U.S. unique visitors during that month alone. As of October 2015, Google reorganized itself into a newly created parent company, the multinational conglomerate Alphabet Inc. The biggest internet companies in terms of their workforce are currently Amazon, Google and eBay.